A few more snippets from last evening’s Fremantle Ordinary Council meeting. Mayor Brad Pettitt introduced a trial where Councillors and staff do not have to stand when they have been given the floor. Only Councillor Jon Strachan said he did not like it. The sound system is not great so by remaining seated Councillors are closer to the microphone and that is good for the public gallery, but please point the microphone at your mouth and pull them close dear Elected Members! Thank you. Councillor Adin Lang suggested when the City removes trees, such as the Moreton Bay fig trees at Kings Square, that the wood be made available to artists, which was extended to the more general word re-use by Council. Good idea! The Director of Community Development said Council had budgeted $ 15,000 for eventual repairs during the removal of the yellow foil of the very successful Felice Varini High Street artwork. They might be well short here. The love for dogs is always emotional so the community speakers on the proposed on leash and off leash area at Frederick Samson park were not happy, but the pristine bush there needs to be protected from everyone and community consultation is still going on. Council at length debated a potential scheme amendment for a small area of White Gum Valley, after an irate member of the public had twice accused Councillor Andrew Sullivan of having been arrogant at a committee meeting the week before and ignoring the 25 submissions against the scheme amendment, pointing out the relative low votes Sullivan received at the South Ward re-election. The scheme amendment and probable development is a very long way away and still going through community consultation, but Councillor Rachel Pemberton succinctly pointed out that the community feed back of only 29 responses out of 400 direct mail outs was not exactly a very high percentage either. Councillors Ingrid Waltham and Jenny Archibald said the feedback they had received was that the White Gum Valley community is not against infill, but that they would accept two storey buildings but not three storey ones. The FPOL-Finance, Policy, Operations and Legislation Committee of the City of Fremantle met in North Fremantle last evening. The Dog Exercise and Prohibited Area Policy item on the agenda attracted many speakers who walk their dog in Frederick Samson Park and who were not at all happy with the proposed restrictions, with one of them saying that council was barking up the wrong tree. Councillor Rachel Pemberton, who has a very cute little dog herself, said that maybe the policy was heavy handed. There are Bush Forever sites that allow dogs on a leash and we need more clarity on how we handle the bush and how we handle the walkers, with or without a dog, she said. It was decided that a site visit by some Councilors and workshopping was needed before the Elected Members could make a proper decision, and the item was deferred. The lease of the Evan Davies building upper level above the Dome cafe for bar and restaurant will have to be confirmed by full council. Mayor Brad Pettitt said he had expected a more cultural kind of outcome, but was assured by Director Tom Griffiths that live music events were planned. The request for special parking permits for residents of the Warders Cottages is also still unresolved with Councillors being worried about setting a precedent for future residential development which does not supply parking, so officers will need to consider all the implications first. The idea is that residents could be offered a yearly parking permit for CoF carparks at 50% discount. It is probably prudent to check how much commercial carparks like Queensgate are charging annually for long-term parking, and also to consider if small business owners in Fremantle should also be offered the same courtesy, because quite a few of them park their car all day while they are attending their shop. Just before the FPOL meeting was the Library Committee meeting, so interesting to hear that the Toy Library has now been made available to Cockburn and Melville residents as well. The North Fremantle Sports Club at John Street is holding a PIZZAS and POOCHES night this Thursday, November 30. Enjoy great wood fired pizzas by Jamel with your four-legged best friend and other friends and family. The club bar will be open to support the local sports clubs and pizzas are $ 20.00. 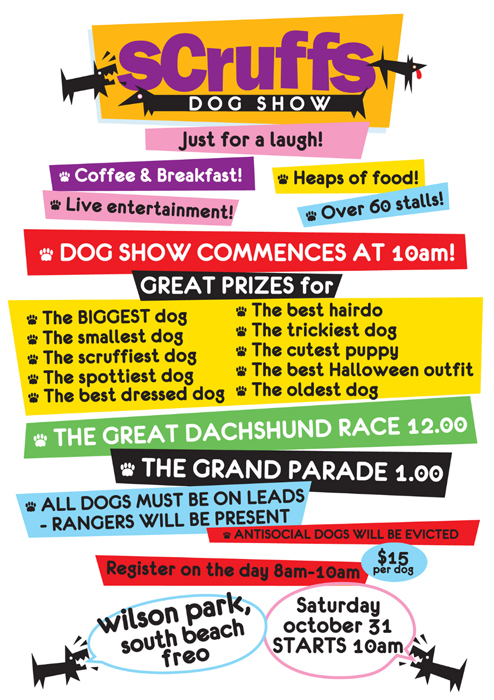 The Fremantle Growers Green Farmers Market is having a DOGS DAY this Sunday September 18, so bring your cuties to the Lefroy Road community market. The categories are: Golden Oldie(over 8 years-old), Cutest Puppy, Happiest Dog, and Smartest Dog. And while there shop for organic food, buy yummy international breakfast and catch up with friends. The market is open from 8 am till midday every Sunday. PROTEST CALLS FOR GREYHOUND RACING BAN IN W.A. There was not a bookmaker or betting agency in sight when Fremantle Greens MLC Lynn MacLaren joined about 200 people and almost as many dogs at Wilson Park in South Fremantle on Sunday morning to call for the WA state government to join with NSW and ban greyhound racing. NSW banned the ‘sport’ after acts of animal cruelty were exposed and mass graves filled with greyhounds were discovered there. There will be a rally to call for a ban on greyhound racing in W.A. at Wilson Park at South Beach in Fremantle this Sunday between 11 am and 1 pm. The location of the rally is quite significant as the first horse races were held at South Beach.